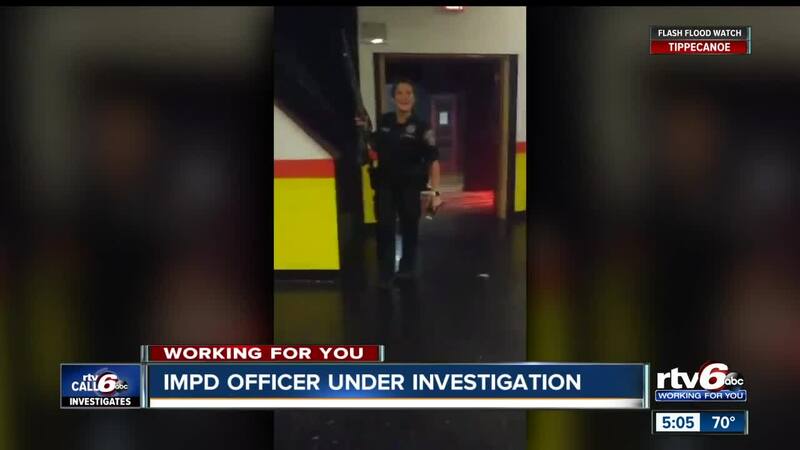 INDIANAPOLIS -- A 17-year veteran IMPD officer is under investigation after a video surfaced of her carrying a shotgun around a club and spraying tear gas in people’s faces. The incident under investigation happened in the early morning hours of August 18th at the Krave Event Center on the city’s west side, Call 6 Investigates has learned. Police were called for a reported shooting during a concert at the club and many of the attendees had already evacuated when witnesses tell Call 6 that a female metro police officer, later identified as Emily Perkins, came into the club with her shotgun and started spraying people with CS gas, which is commonly known as tear gas. "All I was worried about was her having this gun in her hand and was she going to shoot somebody,” Ashley Holder tells Call 6. Holder works as a licensed security guard as her full-time job, but on the night of the incident, she was working a second job in the kitchen at the club. Concerned by the officer’s actions, Holder pulled out her phone and started recording. She said she was waiting to talk to officers with a security guard from the club and watched the officer continue to yell and spray multiple people with tear gas. Holder said the officer then turned toward her and the guard and started spraying them as well. Call 6 Investigates asked the department about the incident and learned an investigation was already open based on a supervisor’s observations of Perkins’ actions at the scene that night, but police had not yet seen the video of the incident. IMPD says Perkins has been placed on administrative duty, pending the outcome of the internal investigation.